Calendar manufacturers produce all kinds (desk, mini wall, engagement, daily, pocket) but the most popular is the monthly wall calendar that has 12 art images based on one theme. The standard themes for many manufacturers are cats/kittens, dogs/puppies, butterflies, birds and flowers. And depending on their consumer base, some also produce calendars with themes such as Americana, country, and specific hobbies like quilting. Thus, artists MUST do their homework and research what kind of art a manufacturer uses BEFORE submitting art to them. When looking at calendar manufacturer websites, notice what kind of art themes they have and the number of different calendars for each theme. For instance, how many cat calendars do they have. If it is more than one? Is it by the same artist or by a different artist with a completely different art style? Calendar manufacturers tend to license art year-after-year from the same artists if the calendars sell well. So unless your art style is completely different and also if the manufacturer feels they can add more calendars with same theme to their product line you will probably be unsuccessful in getting a deal no matter how good your art. For that reason, it is hard to license art to some calendar manufacturers unless the themes are different from the standard themes, that are popular and on-trend, and the manufacturer is willing to take a chance they will sell. Not all manufacturers are willing to take a chance in this economy but some do. For example, several years ago artist Tara Reed was right-on-trend and created images for a "green" calendar as shown in her blog article "Be Green! Be Crafty! Be Healthy!" 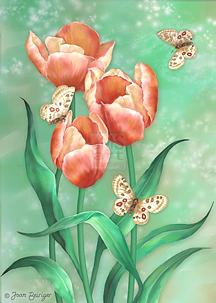 She was successful in licensing it to Trends International for 2010 and another "green" calendar for 2011. Way to go Tara! 1. has themes that appeal to the general consumer. However, some manufacturers do produce calendars that has the art for niche markets such as western, fantasy, and sports. Also, some manufacturers produce calendars strictly for niche markets such as Amber Lotus Publishing with their metaphysical, healing, and spiritual themes. 2. is already formatted for their calendars. There is no universal format and each manufacturer has an unique format. For instance, The Lang Company normal uses art that is 12-3/4 by 10-3/8 inches for their wall calendars. 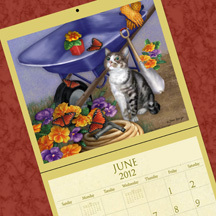 Others use rectangular or square art that fits into their more square shaped calendars. So it is advisable when painting for the calendar industry to create art that can be cropped or edited to fit a variety of calendar shapes. However, some art is used as painted no matter the format and placed on backgrounds to fit the calendar format. But, I do not like the look and think this detracts from the art and the overall look of the calendar page. 3. has themes that are suitable for calendars. It is unlikely that you will get a deal for themes that are not popular to the mass market although most manufacturers do produce calendars for some niche markets. Also if the theme is for a certain season as Christmas it is unlikely a manufacturer will produce it because Christmas is thought to be only for December. BUT any calendar theme may be possible to license. I am wrong about not being able to license a Christmas /Winter themed calendar. See Susan Winget's "Sam Snowman" calendar licensed to The Lang Company. Thus, if you think a theme is licensable for calendars and has enough consumer interest go for it because you never know. Note: A snowman calendar probably works because there are many consumers that love snowmen. 4. the artist is willing to edit (change colors, remove icons, reformat) to their specifications. 5. is in a collection of at least 12 paintings (one for each month) for wall calendars. But more paintings are better so that the manufacturer can have a choice on which ones they prefer. Read more articles about other manufacturers under the Topics section on the side bar. Make sure you read the comments to this article. Consultant Jeff Grinspan posted an informative comment about the calendar industry! In several of my editorials I have stated that if you have the passion, commitment, have the art themes consumers want, and do not give up you should be able to eventually license your art. But is that enough? Art licensing agents often state that they get many art submissions from artists with "bad art." Of course, the words "bad art" is subjective and can mean many things. Does it mean that the themes are not suitable for licensing? Does it mean that an agent that represents fine art thinks that only fine art is good art or an agent that represents country art thinks that any other art is not good ? Does it mean that some art styles are not licensable? 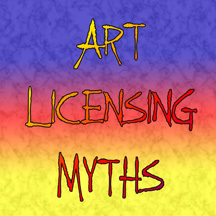 Or does it mean that the art technique is not good enough to license in todays highly competitive licensing industry? There are all kinds of art styles that are licensable. And that have been proven by many artists such as wildlife fine art artists Hautman Brothers, stylized & whimsical graphic artist Laurel Burch, and rustic styled Americana folk artist Warren Kimble. But what makes the art of those artists licensable? Their art evokes an emotional response (nostalgia, cute, gorgeous, etc. 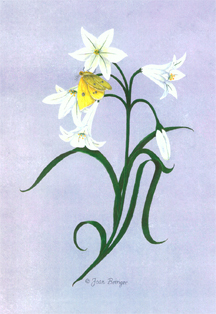 ), has popular themes, and the technique and color of the art is beautifully executed. 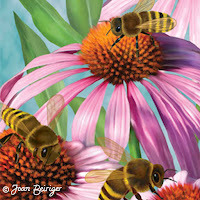 Hautman Brothers realistic wildlife art is drop-dead gorgeous with images and colors that "pop." Laurel Burch's art of her popular stylized cats is full of rich color combinations and rendered in interesting ways. Warren Kimble's rustic art painted on wood with unsaturated color gives his Americana and patriotic images a feeling of time gone-by. Recently a friend sent me a link to an article "Kathryn Stockett's 'The Help' Turned Down 60 Times Before Becoming a Best Seller." In it, author Kathryn Stockett wrote an inspiring and hilarious account on how she did not give up in trying to get her book published. But she did more than just send her book to literary agent after literary agent. She continued to improved her writing by " making the story tenser, more riveting, better." And that is just what artists need to do when they are continuously rejected by manufacturers and art licensing agents IF they are really passionate and determined to license their art. They need to figure out why the art is being rejected and make it better. Note: Not only did Kathryn Stockett's book "The Help" become a best seller after five years of writing and 3-1/2 years of rejection, a movie based on the book was released this month. Many artists that license their art have similar journeys as did Kathryn Stockett. They also had rejections until they finally achieved success. The following is my story. In the late 1990s, I decided that I wanted to license my art. The reason is immaterial and too long to tell in this article. But first I had to learn how to paint (another long story) and I decided to teach myself by reading art books about painting with acrylics. This was not the smartest move on my part because I should have taken some art classes. Clearly my art was not very good. The art at the left is one of my first paintings. Compare it with the one of my recent paintings at the top of this article. Even though I instinctively thought that my art was not as good as other artists work, I did not know why. But I continued to paint and I slowly improve my technique (and I mean slowly). It has taken me years to improve my technique but I could not have improved it if I was not willing to ask art experts (art directors, consultants, manufacturers, artists) to critic my art and if they were not willing to give me constructive criticism. I heard such words as "your art is so dark," "it doesn't pop," "it is pretty but it doesn't emote a me-to-you emotion (for traditional greeting cards)," "your art isn't polished," "the background is too busy." I did not take these criticisms personally and in fact I welcomed them because they helped me to see what was wrong so that I could improve my art. Unfortunately, too often art experts do not have the time to critic artists work and also are afraid to hurt their feelings. Thus, artists do not find out that their art is not good enough to license. So how do you figure out if your art is good enough? First, compare your art with licensed artists art that have a similar art style. And second, ask others that are knowledgeable about art for their honest opinion. The following is some suggestions on how to accomplish this. Agencies choose art to represent that they consider good and think they can license. Look at art on their websites that has a similar style as yours. Is your art as well executed as the art on the website? If you think so, then ask art experts their opinion to make sure that you are right. To find art agency websites, read "List of Over 50 U.S. Art Licensing Agencies." You can hire an art licensing consultant / coach to give you advice about your art but I caution you that art licensing coaches may know the art licensing industry but not all are experts in giving constructive criticism. They may not want to hurt the artist's feelings or just do not know enough about art that is licensable. So before hiring consultants to critic your art make sure to check out their qualifications. If the consultant has the qualifications, ask if she/he is willing to give a honest opinion and constructive criticism. To see a list of some art consultants / coaches, read "On Art Licensing Coaches (consultants)." Art licensing support groups share art licensing knowledge and the members help one another license art. Giving suggestions and critiquing art is one useful function of this kind of group. There are at least two of these groups in the U.S. One is in the San Francisco bayarea (California) and another in the Denver Colorado area. If there is not a support group where you live, consider forming your own. Read "Start an Art Licensing Support Group" by Kate Harper for information about the San Francisco group. Note: I belong to this group and find it inspiring and very helpful. 7/10/17 - Unfortunately the San Francisco art group disbanded several years ago. Find another artist that is willing to give you constructive criticism in return for doing the same for her/him. If you do not know of anyone, advertise on one of art licensing linkedin groups or the art of licensing yahoo forum that you are looking for an art pal. For information about art licensing forums, read "Networking Resource - Art Licensing Forums," and " Art Licensing Resource: Networking in Linkedin." Another way to get constructive criticism on your art is to take art classes. Many towns and cities have adult education classes, community colleges and freelance artists that offer art classes. When you are rejected by a manufacturer or agency, call them up and ask them the reason why. I found that many times that the art director or agent is reluctant to tell you why but sometimes you can learn important information that will help you improve your art. If you are unsuccessful in licensing your art and you have done all the right things such as created popular art themes, collections, and product mock-ups, maybe your art technique is not good enough. Ask questions, improve your art, and do NOT give up. "Editorial: Not all art is licensable"
"Don't give up Your Dreams and Grow a Thick Skin - Part 1"
"Don't Give Up Your Dreams and Grow a Thick Skin - Part 2"